STAR Bomber Joe Daniher has added to his long list of 2017 accolades, scoring his first Crichton Medal as Essendon's best and fairest in a tight count on Thursday night. Daniher, 23, gathered 451 votes to become the third Daniher to win the prestigious award, after uncles Neale and Terry were successful in 1981 and 1982 respectively. 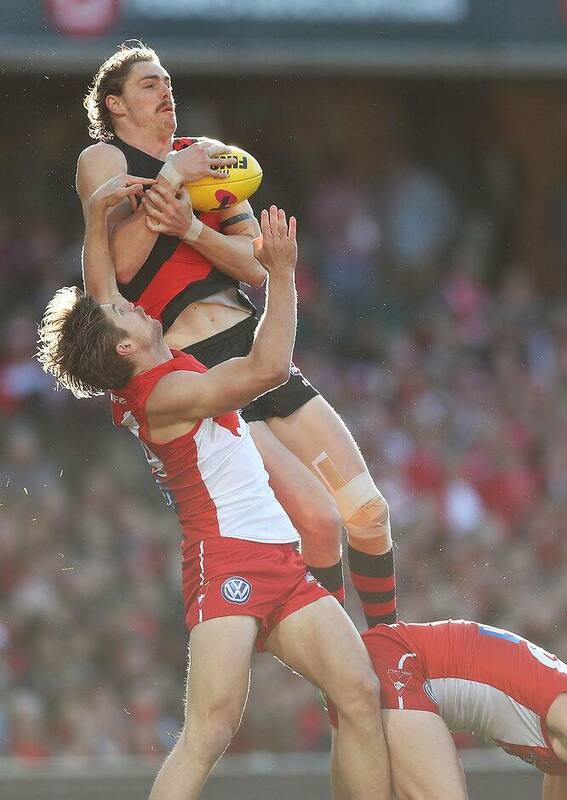 Former captain and 2013 winner Brendon Goddard (441 votes) finished second, while current captain and 2014 winner Dyson Heppell (440) came third in his terrific comeback from a year-long doping suspension. The voting process requires six coaches to rate all players from zero to five in every game for the year, meaning each player can poll a maximum of 30 votes per match. Daniher's success is the cherry on top of an outstanding season, which yielded 65 goals (to finish fourth in the Coleman Medal), his first All Australian selection and the AFL Mark of the Year for his screamer over former teammate Jake Carlisle in round 17 against St Kilda. The key forward was also awarded the Anzac Medal for best on ground against Collingwood in round five, as well as the Tom Wills Medal for best on ground in round eight's Country Game against Geelong. In a rather quirky speech, Daniher took multiple digs at Goddard’s mischievous behaviour around the club, apologised to his mother for spilling wine on his shirt, and struggled to hold back tears on multiple occasions. "I’m lucky to have been a be a part of it (the club) since I was 13-14 and to live out my dream, I’m really excited about where we’re going as a club and there’s some really exciting times ahead," Daniher said. "There’s some beautiful people at this club, some beautiful people at the top of the chain and I’m looking forward to some great things happening in the future." On a night that honoured and farewelled retiring champion – and three-time Crichton winner - Jobe Watson, star Cat-turned-Bomber James Kelly and club stalwart Brent Stanton, Daniher still owned the evening. He also picked up the Matthew Lloyd Leading Goalkicker award for a fourth consecutive year, and secured the Cheer Squad Award from Essendon’s most avid fans. Second-placegetter Goddard played every match this season, averaging nearly 27 disposals and leading the club for marks, while Heppell led the side in contested possessions and clearances. 2016 winner Zach Merrett narrowly missed out on a place finish, tallying 439 votes to finish in fourth, with fellow midfielder David Zaharakis (412) in fifth. Daniher’s most emotional thanks were saved for Merrett, as both shared quiet tears for their close bond. "You’re an inspiration here, you’re one of my best mates, you drive me every day and I’m looking forward to a really good friendship going forward," Daniher said. While Daniher admitted it was "weird" to be so emotional about his teammates, he also paid tribute to fellow Bombers Craig Bird and Matt Dea. "You just don’t know the impact that your friends can have on you," he said. NAB AFL Rising Star winner Andrew McGrath added to his list of awards, as expected, with the Lindsay Griffiths Rising Star Award to complete a remarkable debut season for the former number one draft pick. Among the other award winners was delisted veteran Heath Hocking, whose departure from the club had a silver lining with the tough on-baller receiving the Bruce Heymanson Best Team Player Award.